Jenn is truly amazing. We don’t know how she does it all, and she does it all well! She has a heart like no other. Jenn is a super volunteer at the Idaho Humane Society. 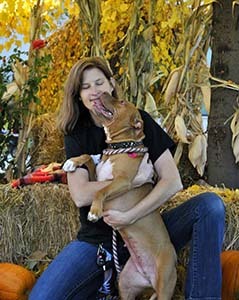 She runs the low cost See Spot clinic for spaying and neutering pit bulls and pit bull mixes. She can almost always be found there on the weekends supervising dog socialization play groups. She has great dog handling skills and special training to break up dog fights. Jenn is always willing to help anyone visiting the shelter. Jenn is the star of this commercial seeking a grant from Idaho Power. Jenn is highly active in the Boise Bully Breed Rescue where she fosters pit bulls and helps with other aspects of the organization. She was in charge of placing all 50+ pit bulls from a highly publicised rescue in Idaho a few years ago. It took several months to rehab and place the dogs in their new homes. Jenn is also a part-time vet tech. We feel very fortunate to have Jenn working for us part-time. She is caring and knowledgeable in so many areas of pet care and behavior. She is an ace dog walker and also great with skittish and fearful dogs.